A situation is unfolding as you read this. A live feed with currently 60k people watching, 56k comments and 80k shares (and growing) is being shown on Facebook. Kevin Gilbert seems to be the only LIVE feed coming from Standing Rock at a police blockade on a bridge on HWY 1806. They are using extreme force on unarmed, peaceful water protectors. It is sub-zero temperatures right now at Standing Rock and police are using water cannons to spray the protectors. 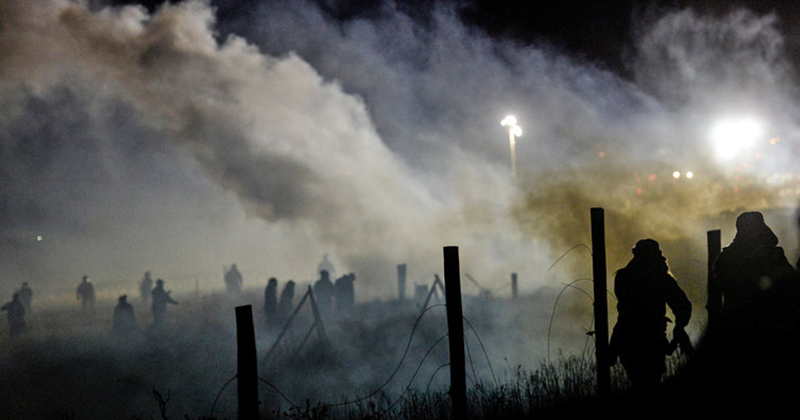 Tear-gas is also being used. In the LIVE feed, Kevin interviews a friend who was on the front lines providing blankets to people when she was heavily tear gassed and as a result, she vomited and peed herself. According to UnicornRiot, this all started when protectors attempted to remove the blockade on the bridge to open up the HWY. There were also mentions of Dakota Access bringing in drills under the cover of night. These are people that just want to protect the land and the water they drink. It could be your friend, brother, sister, mom, dad, uncle, aunt, niece… out there on the front lines. Thousands of people watching LIVE are referring to this as torture. Honestly, I’m having a hard time understanding how this could be considered anything but torture. Where is senior leadership and mainstream media in all of this? These are the most common questions asked by people in the comments. Myself and a couple other CE journalists just returned from Standing Rock and believe me when I tell you, what is happening at Standing Rock goes beyond simple morals or “right versus wrong.” There is a serious injustice taking place and it affects every single person living on this planet, not just the Indigenous people living at Standing Rock. When will we stand up to corporations that run around doing whatever they want, whenever they want? Now is the time. The authorities are siding with and protecting Energy Transfer Partners, the parent company of Dakota Access, while the people are left to defend themselves, demanding to be heard. The cell service is not great there. There are reports of police jamming signals as well, so the LIVE is choppy. Watch here. And for new live feeds just go straight to his Facebook page. Where are the North Dakota National Guard and Reserves at? They should be upholding the Constitutional Rights of these BRAVE & COURAGEOUS Americans and stop this blatant act of war against the American People by domestic terrorists! If the military that is SWORN to protect our Constitutional Rights will not do their jobs, then what must we do? Where is the Constitutionally Authorized Militia as well? How can we stand up for our Rights and change the status quo if we let our People suffer alone? Wake Up America & DO Something to help stop this act of war against PEACEFUL protesters that have the RIGHT to Peacefully protest to PROTECT our water & lands from the psychopaths that want this inferior waste to be distributed! !